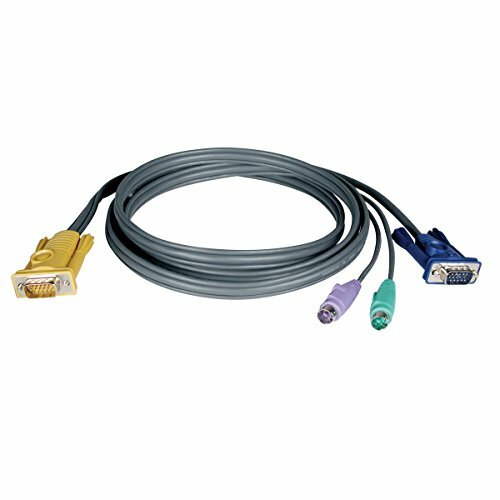 Premium Y-cable kit connects PS/2-equipped PCs or console converters to KVM Switches. Three-in-one color-coded PS/2 mouse, PS/2 keyboard and HD15 monitor connection system simplifies cable management. Flexible molded design provides integral strain relief. Dual-layer foil- and braid- shielding minimizes EMI/RFI interference. Cable Type: Keyboard/Video/Mouse (KVM); Connector/Port/Interface: Two HD15 Male/Two PS/2 Male; For Device Type: KVM Switch; Connects Devices (From/To): KVM Switch to PC; Keyboard/Mouse/Monitor to PC.